This entry was posted in Genealogy, Writing by Christine. Bookmark the permalink. Delightful! I’m hoping for a book to come out of all this! Just love reading family history…Bob would have really enjoyed your writing, Chris. I’m sorry I didn’t realize it was the NaNo month. For some reason I thought it was January and I was waiting for it. LOL. I am going to try and do something similar in the month of December. Glad to hear of all of your progress on your novel. Have a great time in New Zealand! 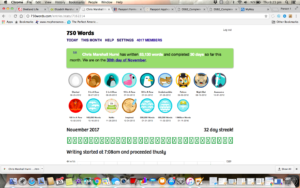 Congrats on reaching your writing goal! That is an amazing level of research. I cannot even imagine how you were able to dig those items up. Kudos.